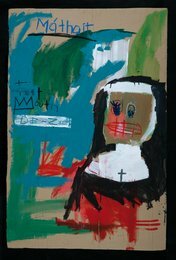 My work has been influenced by my family and the New York artist Jean-Michel Basquiat. The size, choice of materials and style depict various aspects of the personality and spirit of my family. Despite the simple, childlike quality of the images, they are full of symbols and layers of meaning that capture (to me) my family’s traits. I chose to work big, because to me my family is big; they are everything to me. The box is reminiscent of a large video cover, inviting the viewer into my world, the way I see my life.